This is my mum’s oatcake recipe. She used to divide the dough into four, roll each piece into an 8″ circle, then cut it into quarters before baking. 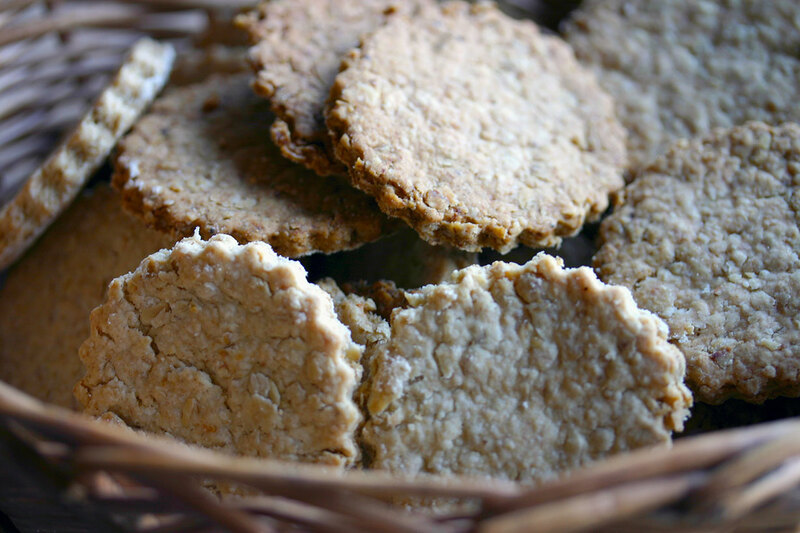 I prefer to make round oatcakes using a biscuit cutter. In a large bowl, combine the flour, oatmeal, baking powder, salt and sugar. Rub the butter into the dry ingredients until it looks like coarse breadcrumbs. Add just enough liquid to form a dough. Roll the dough out on a floured surface to a thickness about 1/4 cm. Cut out circles of dough and place on a floured baking tray. Cook for 10 to 12 minutes, or until starting to brown. Cool on a wire rack. These oat cakes sound so austere! I’ll have to wait to make them in Lent. I recall a trapezoid shape mom cut those into. It’s funny as a kid you don’t realize how good you’ve got it when someone takes the time and care to make things from scratch.